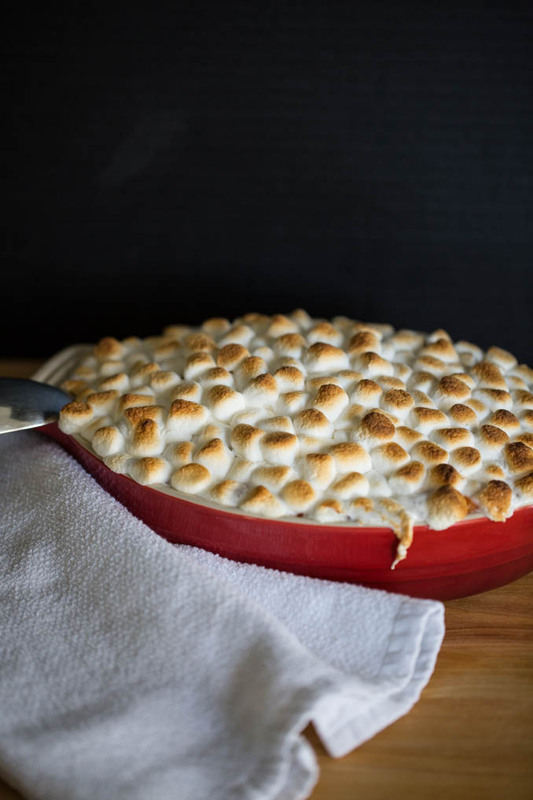 The BEST Sweet Potato Casserole EVER! I can’t believe I’ve never posted my Sweet Potato Casserole recipe after years of making it. I suppose since I only make it once a year it’s too late to share my recipe once Thanksgiving has arrived. However, this year we were invited elsewhere so I decided to make it early so we could still enjoy it. I started out about 31 years ago having Thanksgiving at our home, since we had our first child. It was easier than dragging everything to my parents home. Back then I made a Sweet Potato Casserole that had pineapple and nuts in it. It was outrageously delicious, but many of us except my dad and oldest sister felt it was a bit too sweet, and needed to be toned down a bit. That’s when this BEST Sweet Potato Casserole EVER was born! Every family has their tried and true favorites that you never want to mess with by changing some of the ingredients, or that heaven forbid get omitted from the meal. While some traditions may seem silly when you’re preparing a huge meal to feed an army – like bringing in White Castle for Appetizers – Thanksgiving just wouldn’t be the same without them! All the little things that to an outsider may seem strange, unsuitable, or not to their liking, truly don’t matter. What matters is that you create the traditions in your home. Those traditions not only last a lifetime, but create memories you’ll remember forever!!! *My moms famous Challah Stuffing – Thanksgiving wouldn’t be the same without it! Vanilla Frozen Yogurt – I know, like why now something healthy? What MUST HAVE’s are at your Thanksgiving table? Below is my recipe for The BEST Sweet Potato Casserole EVER! I will say that some years when our group got smaller we may have this casserole or some sort of mashed potatoes or plain baked sweet or Yukon Gold potatoes – depending on moods and waistline. I’ve been doing Thanksgiving now for over 30 years. I took it over from my mom and having it at my parents home, to ours. Now my son has decided that he’s wants to have it at his home. Now new traditions will be created while keeping the old as well. While I may not have the hustle and bustle of creating a full Thanksgiving meal at our home this year, I’ll be bringing some dishes, as will others. Most important, our family will be together, sharing great food, laughter, love, and building new traditions to create a lifetime of memories. From Our Home to Yours – I wish you all the Happiest of Thanksgivings EVER! 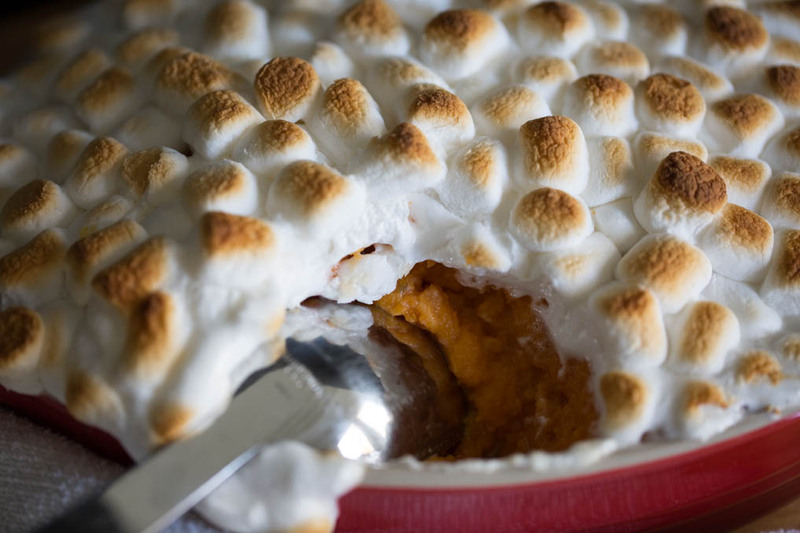 If you're a fan of sweet potatoes then this Thanksgiving you owe it to yourself to try The Best Sweet Potato Casserole EVER! This comforting dish will warm up your tummy and fill you with happiness. Place potatoes and salt in a large pot and add water to cover. Bring to a boil over high heat. Reduce heat and cook until potatoes are tender, about 30 minutes. Drain. Preheat oven to 375 degrees. When cool enough to handle, peel the potatoes and cut them into large chunks. In a large mixing bowl, mash the potatoes. Add sugar, condensed milk, cinnamon, butter, and orange juice. Whisk until smooth. Stir in the chopped pecans, if using. Empty the mixture into a buttered 9-by-13-inch baking dish. 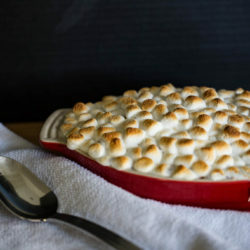 Top with marshmallows and bake until heated through and marshmallows are slightly browned, 20-30 minutes. 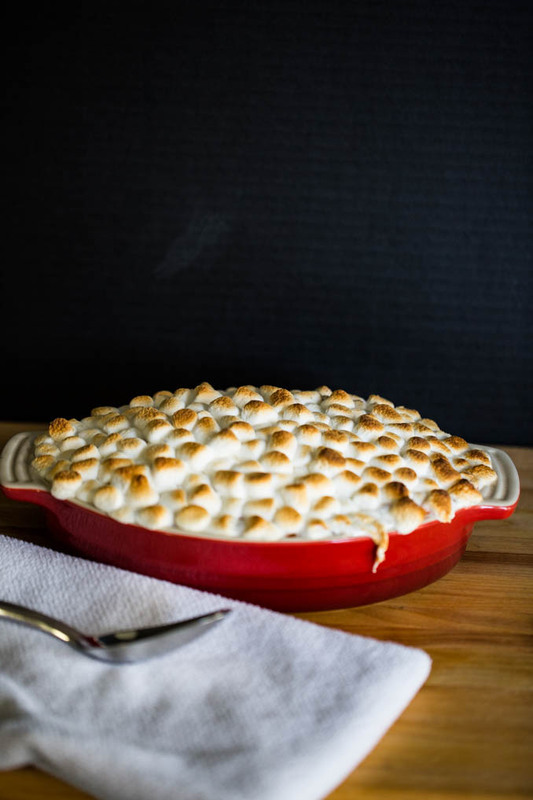 I love this lightened up sweet potato casserole! And your whole menu is an inspiration. Like you, I started hosting Thanksgiving about 30 years ago—now it’s just the 5 of us, but the menu is almost always the same. Hope you have a fabulous holiday at your son’s house! When you say it’s just the 5 of us, I know what you mean. Our group was much larger and little by little family has moved away or are no longer with us. Then the cycle will begin again at some point with our children getting married and maybe someday having their own families and their spouses families joining us. The cycle of life and the holidays! Hope you have a joyous holiday! Oh, Vicky! Sweet potato casserole is my favorite Thanksgivinh side. I tried for the first time many years ago and got hooked. I am looking forward to having it again. Happy Thanksgiving! I agree. I love the creaminess and sweet flavor of the potatoes. Enjoy your holidays! 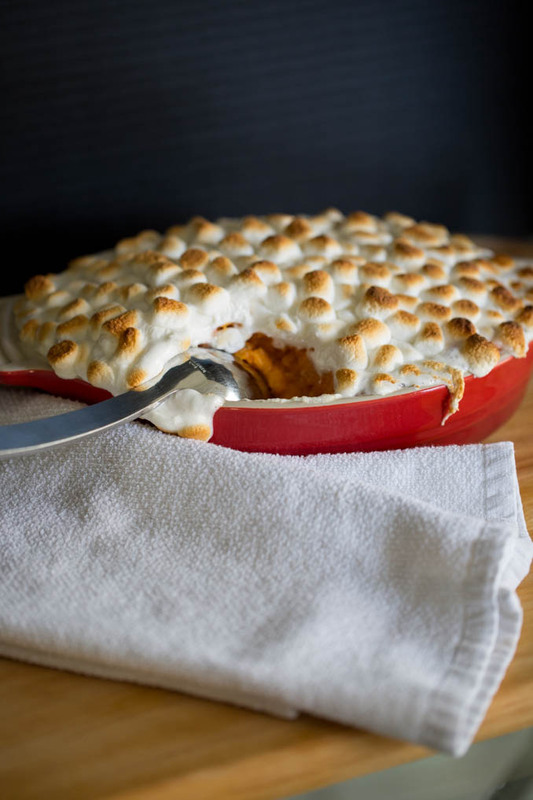 This really does look like the best sweet potato casserole ever. YUM! Thank you, we think it is. If you try it please let me know your thoughts. 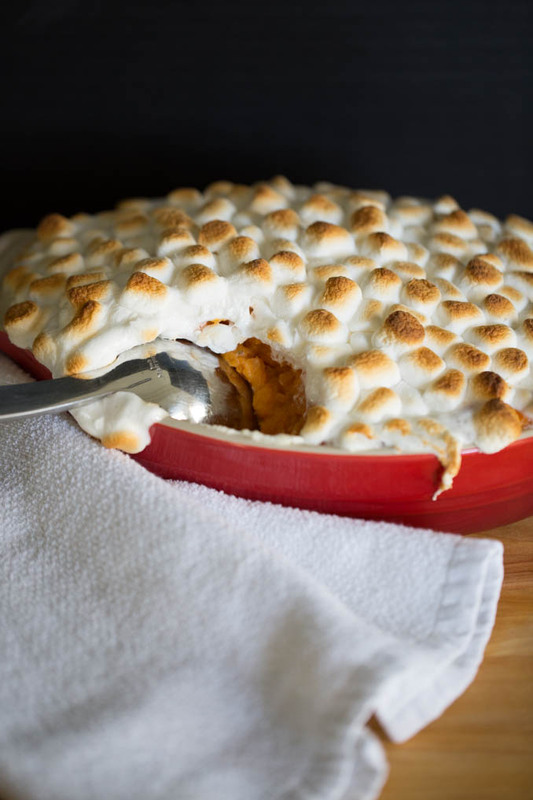 This is the prettiest sweet potato casserole I have ever seen! The marshmallows are browned so perfectly.